Purification Antibody is purified by protein A chromatography method. Immunogène Antibody produced in rabbits immunized with a synthetic peptide corresponding a region of human MSH2. Sujet MSH2 was identified as a locus frequently mutated in hereditary nonpolyposis colon cancer (HNPCC). When cloned, it was discovered to be a human homolog of the E. coli mismatch repair gene mutS, consistent with the characteristic alterations in microsatellite sequences (RER+ phenotype) found in HNPCC. Indications d'application MSH2 antibody can be used for detection of MSH2 by ELISA at 1:62500. 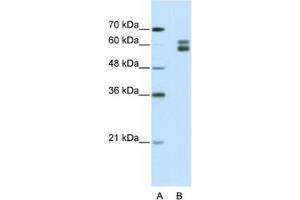 MSH2 antibody can be used for detection of MSH2 by western blot at 1.25 μg/mL, and HRP conjugated secondary antibody should be diluted 1:50,000 - 100,000. Reconstitution Add 100 ?L of distilled water. Final antibody concentration is 1 mg/mL. Stockage commentaire For short periods of storage (days) store at 4 °C. For longer periods of storage, store MSH2 antibody at -20 °C.